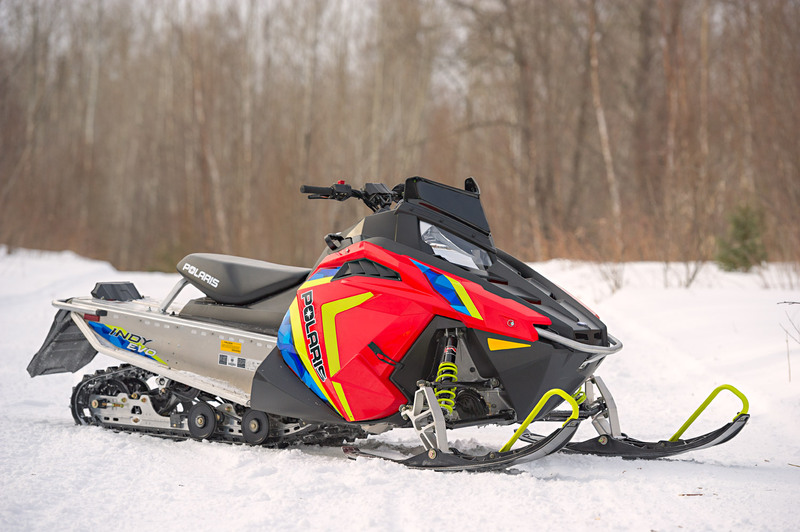 The 2019 Polaris Indy EVO just might be the sled for the masses…or possibly for the missus, or the kiddos or the family member you just don't trust with anything liquid cooled or able to go over 50 MPH. The EVO is a total rethink of the midsized sled. It's really not all that mid-sized actually; it's a full size Indy chassis with standard size bodywork, a real track, skis, and the works. It has a very powerful 550 fan-cooled engine and while it sounds like it might not be a mid-sized sled at all, the truth is while it isn't…it actually is. The CDI box makes the engine top out at 50 MPH and the fact Polaris Engineers limited power electronically is really interesting, because you get full power right up to that speed, which eliminates the stigma surrounding mid-sized sleds, which typically have a lazy, old or just not fun motor under the hood. The 550 is linked to a new, easy-to-operate and more controlled throttle flipper that will reduce the amount of effort required to squeeze it and reduce surging through the whoops typically experienced by novice or new riders. This means the confidence level goes up and the risk goes down. Acceleration is surprising because you get a whole lot of giddy up and go. While the skis will stay planted if you sit down and gas it, they will get light and wheelie well over a hundred feet should you just stand up and pull back only every so slightly, adding to the fun factor for those whose confidence is building. While there is an EVOlution kit available for the EVO making it essentially a full powered 550 Indy with full width and full suspension travel, the stock model has a very lowered look to it. Polaris put its focus on massaging the Indy chassis so it works perfectly for a smaller rider. This attention to detail means smaller pilots can rail corners just like someone riding a full-sized Indy. Travel has been pulled out of the front and rear suspension of the sled to lower the ride height and add confidence by dropping the center of gravity. When you do this the sled becomes more stable and further inspires confidence. 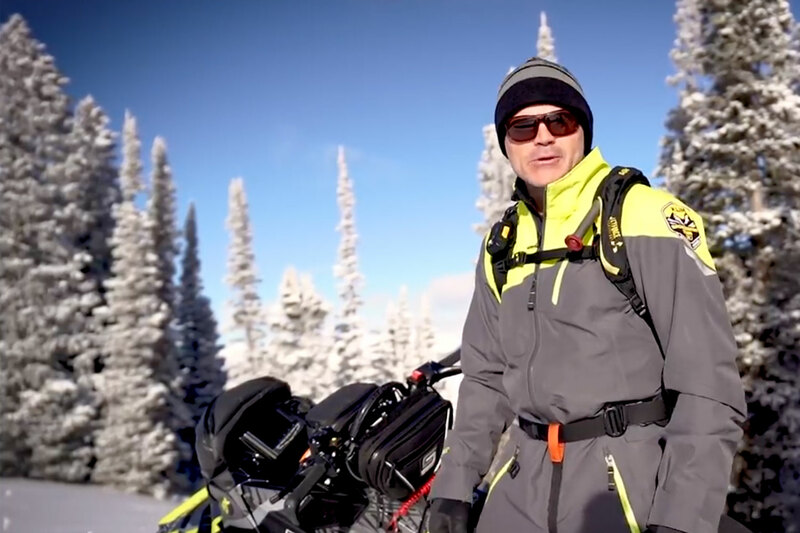 Experienced riders will use up the suspension on the EVO, but this is not a sled for the average rider, it is a stepping stone to a sport we are all addicted to and a great start for those lacking the skills or confidence required to handle a full-sized sled. I don't for a second believe the EVO is only targeted at 12 to 16 year olds. This is a sled for riders 12 years old to 85 years old. It's the sled sled your wife will feel more confident on, the sled you know is the right fit for the neighbour you've always wanted to take for a ride, it's a sled for the masses who don't have the muscle, the skill or the confidence yet to ride a full sized sled. The Indy EVO is the sled we've all been asking for. It's the sled that's going get a new generation addicted to snowmobiling and that's an addiction I have no problem feeding.